This year’s distinguished lecture series in honour and memory of art icon, Ben Enwonwu was delivered by renowned printmaker, painter and sculptor Bruce Onobrakpeya ,with the theme : ‘Informal Art Education through Workshops: Gains and Challenges as lessons from the Harmattan Workshop Series’. The event held at the Nigerian Institute of International Affairs, Victoria Island Lagos, with a gathering of the art community and other art supporters. Through a digital video presentation, Onobrakpeya showed how his works have traversed several art patterns. He showed work processes and magnificent results from different people who are working in his studio. Aside having to train interns in his studio in Lagos, Onobrakpeya ‘s Harmattan Workshop which usually holds at Agbarha-Otor, has been a great resource for the development and sustainability of art in Nigeria. During the Hamattan Workshop artists learn fresh perspectives to the work they have always done, while many other participants are trained in any art or craft form that interests them. On completion of the video show, Onobrakpeya expressed satisfaction on how the Ben Enwonwu Foundation is helping to share art knowledge and create a rallying point for the development of contemporary art . 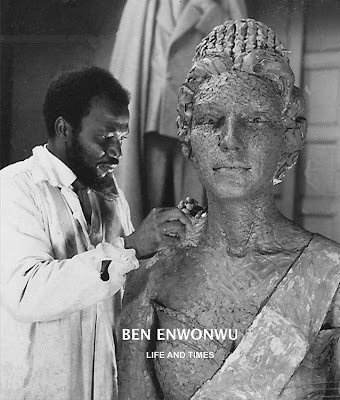 The Ben Enwonwu Foundation was established in 2003 with the aim to sustain and build on Enwonwu’s life and works though which he forged a philosophical basis for modern Nigerian art by fusing Western techniques and indigenous traditions. Enwonwu’s recognition internationally and success increased the visibility and appreciation of modern African art. Earlier speakers on the lecture series include: Prof Jerry Buhari, former Dean, Faculty of Environmental Design, Ahmadu Bello University, Zaria; Mr Donald Duke, former Governor of Cross River State; Prof Yemi Osinbajo, former Attorney General and Commissioner for Justice, Lagos State; Prof Freida High Tesfagioris, Department of Afro-American Studies, University of Wisconsin, United States Of America; Dr Christopher Kolade, former Nigerian High Commissioner to the United Kingdom; Prof Wole Soyinka, Nobel Laureate in Literature; Prof John Aiken, Director, Slade School of Art, University College, London; and Chief Rasheed Gbadamosi, former Federal Minister of Budget and Economic Planning. Titles of lectures given according to the speakers listed above are: Beyond Two-Dimensional Art; The Role of Art and Tourism In National Development; Enwonwu: The Responsibility of Privilege; Positioning Art and Culture for Sustainable Influence in Nigeria; Art as a Tool for Cross-Cultural Development; Art, Tradition and Modernity; A Position for Art: Locating Sculpture and Its many Contexts; The Place of Creative Art in the History of Man.